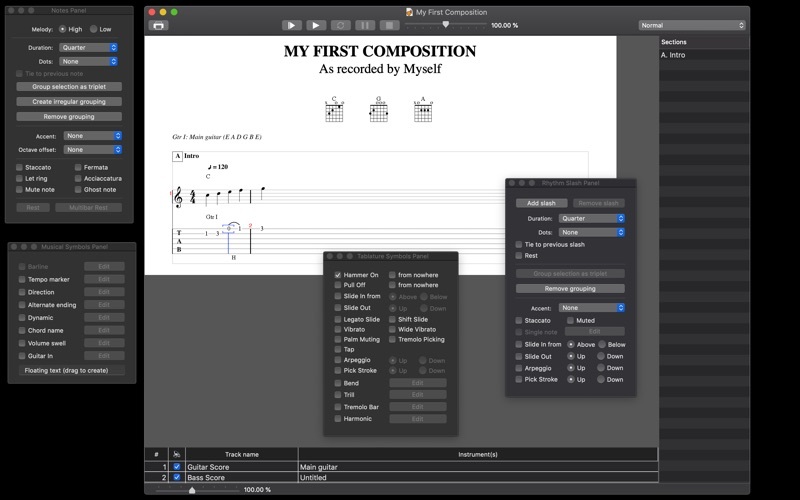 Tablatures is a friendly guitar/bass tablature editor. Tablatures is compatible with the popular PowerTab, a well-known and widely adopted tablature editor for Windows systems. Thus you can share your music even with those members of your band that don't own a Mac! Moreover, you can easily find thousands of song transcriptions in this format on the net. Tablatures can also import most GuitarPro 3-7 tabs. The tabs you create can be exported in MIDI format and during playback you can follow the tab on screen to make it easier to learn tracks.